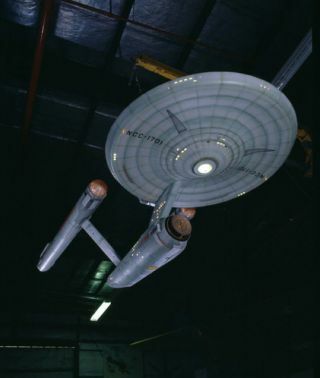 This model of the fictional starship Enterprise was used in the weekly hourlong “Star Trek” TV series that aired September 1966 to June 1969. Warp drives. Artificial gravity. Terraforming planets. These concepts might sound as though they're ripped from the pages of science fiction, but they're the topic of serious scientific presentations at a symposium this weekend sponsored by DARPA, the Defense Advanced Research Projects Agency. Called the 100-Year Starship Symposium, the public event will run Sept. 30 to Oct. 2 in Orlando, Fla. For three days, scientists from universities, NASA centers and private institutions will discuss far-out ideas for building a spaceship to visit another star. The nearest star to the sun, Alpha Centauri, is more than four light-years away, meaning something traveling at light speed would take four years to reach it. Any object with mass, such as a spacecraft, would have to travel significantly slower, according to the laws of conventional physics. But that's not stopping NASA and DARPA, the agency responsible for some of the early innovations that led to the Internet, from imagining such a mission. The two agencies have teamed up on a $1 million project called the 100-Year Starship Study to begin contemplating technologies and organizational strategies that could enable an interstellar mission to launch within 100 years. "The 100-Year Starship is about more than building a spacecraft or any one specific technology," DARPA officials wrote in a statement. "Through this effort, DARPA seeks to inspire several generations to commit to the research and development of breakthrough technologies and cross-cutting innovations across myriad disciplines." Panels will include debates on the merits of fusion versus nuclear thermal propulsion, as well as the social and psychological implications of sending humans on a one-way mission to the stars. Religious and philosophical aspects of interstellar travel will also be discussed. But a note to would-be space travelers: It's too soon to sign up for the trip. "Neither DARPA nor NASA are actually building a 100-Year Starship," DARPA officials wrote. "We are planting seeds for an organization. Consequently we are not taking starship crew applications at the present time." Check back at SPACE.com for senior writer Clara Moskowitz's live reporting from the scene.